16-Piece BBQ Grill Tools Set Just $44.99! Down From $87! PLUS FREE Shipping! You are here: Home / Great Deals / Amazon Deals / 16-Piece BBQ Grill Tools Set Just $44.99! Down From $87! PLUS FREE Shipping! Still looking for a Father’s Day Gift? Why not check this great deal at Amazon! 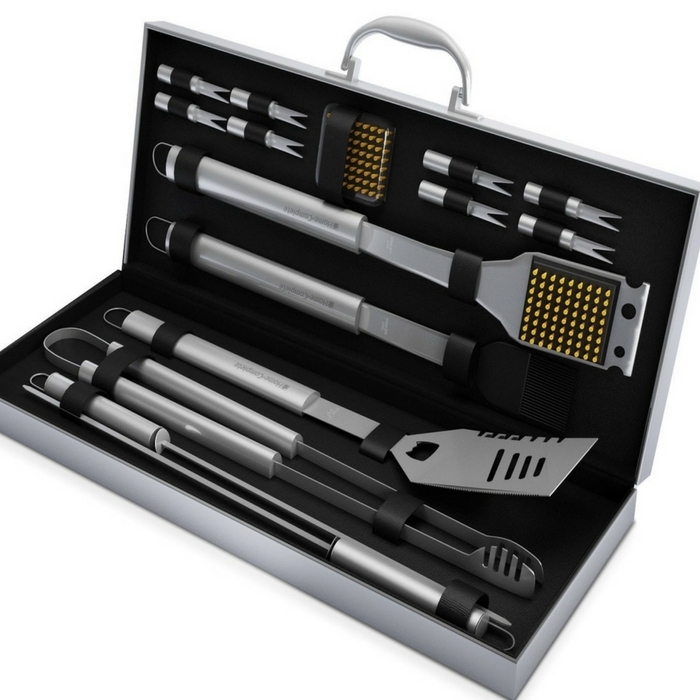 Score this 16-Piece BBQ Grill Tools Set for just $44.99 down from $86.99 PLUS FREE shipping! The best part of a perfect BBQ is having the right tools for the job. Without these, you would end up having a very unpleasant experience. This 16-Piece BBQ Grill Set assures you a great time with friends and family around! Everyone will admire the sleek beauty of these tools and how they make grilling so effortless! If your dad or husband loves to grill, then this is a perfect gift for him this Father’s Day! STAINLESS STEEL QUALITY – Won’t rust! Won’t crack like wood handles do. Easy to clean.